Following Vespers the celebration began with the blessing of the Slava Kolach in the presence of representatives of the diplomatic corps, official representives from the State of Maryland, all educational organizations, cultural groups and many parishioners and friends of St. Luke Serbian Orthodox Church. The formal academia in honor of Saint Sava was led by Branko Terzic, the Royal Adjutant and member of the Privy Council. The academia began with the Hymn to the Saint Sava sung by all program participants and directed by Popadija Jelena Vranic. Afterward, the parish priest, Rev. Dr. Vasilije Vranic, offered his words of greeting followed by Serban ambassador Djerdj Matkovic who wholeheartily supports all the religious and cultural events of the Serbian communities throughout America. Representative of Republika Srpska in Washingon, Obrad Kesic, spoke briefly but succinctly of the significance of the work of St. Sava as enlightener and statesman. The St. Luke Church and Serbian community was honored to be greeted by the Governor of the State of Maryland, Larry Hogan who addressed the community in a letter. The governor's greetings were delivered by Deputy Secretary Luis Borunda. The honor of delivering the St. Sava Address was given to Professor Dr. Ljubica D. Popovic, a long time professor of Medieval Arts at Vanderbilt University. In her address she presented the life and work of Saint Sava in a very interesting way. By showing slides of important sites from the life of the saint, written documents that appeared through his direct efforts and frescoes that were created during his lifetime. Professor Popovic bridged the gap of 800 years that separates us from our spiritual father and enlightener and brought him closer to his children that reside far from Serbia. The program continued with the Serbian School “Nikola Tesla” who presented their work. A younger group of students recited the poems "The Paths of St. Sava" by author Mosa Odalovic, while the older group performed the dramatization of the life of Saint Sava by Nedeljko Popadic. Coordinators of the school Radmila Bozic, Marija Eremic and Snezana Djokic, as well as all teachers, were thanked for a the successful work of the school. The newly established St. Luke children's choir presented the songs of St. Bishop Nikolai “Christ Comes Among Us” and Fr. Nazarius “Holy Saint Sava, Light in the Darkness”. As in previous years the youngest group recited poems while the folklore group performed an array of dances from Serbia. Taking part in the program was pianist Milica Sekulic with the Chamber ensemble „Srbijana“, led by Professor Dr. Sanja Grujic Vlajnic. Milica performed a number of compositions for piano by Serbian composers Kornelija Stankovic and Vera Milankovic, while the chamber ensemble „Srbijana“ presented a collection of Serbian patriotic and folk songs. The formal part of the program closed with remarks by Marko Rasevic, member of the St. Luke Trusteeship, after which the evening continued in fellowship and dance. 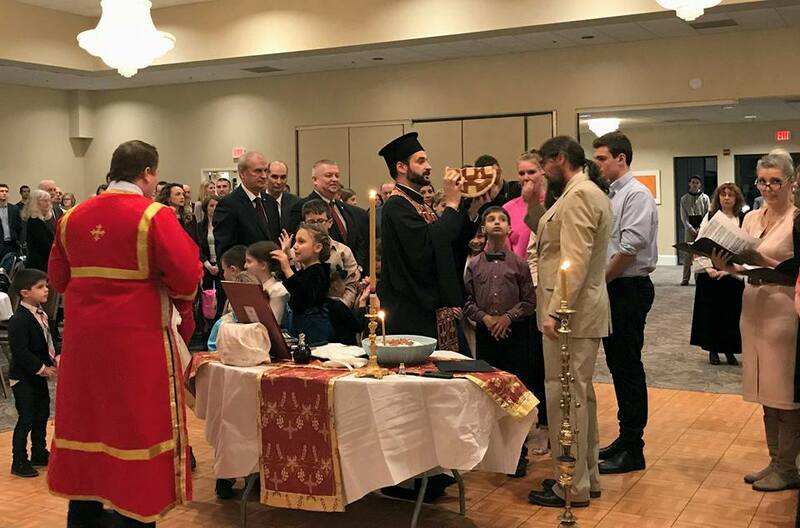 Through the efforts and fatherly care of His Grace Bishop Irinej of Eastern America the Serbian community in Washington is becoming more and more active. The number of attendees at the Saint Sava Academy surpassed all expectations. The evening's celebration was in the spirit of fellowship and unity of the faithful people who bestowed their thanksgiving unto God for the mercy He has bestowed upon them through the intercessions of Saint Sava, who look with optimism to the future, Calling with love to Saints Sava.